Submitted by djod on Fri, 10/31/2008 - 22:41. Hello Guitarsite.com users and viewers. I have a special treat for everyone here. I just recently replied to the admin's news on the world's most expensive guitar. Well, I am here to share with you the World's most expensive & rarest guitar the no one knows about yet, but will soon. Here is Sir Johan III custom made washburn guitar from Bob Marley as they were friends and he was Bob's guitar tech, Sir Johan is the only person in the entire world to have been personally given a personal guitar from Bob that occured in Nov 21, 1979 during a concert. The most he was offered for the guitar was $5 million back in 2004 from Jamaican descent billionaire Michael Lee Chin, but he refused the offer to do great things with the guitar for the world. DJOD is about ready to unfold and shock the entire music community, charities, organizations, guitar fanatics & many other people around the world. Posted by djod on Fri, 10/31/2008 - 22:47. Posted by Tim on Sat, 11/01/2008 - 00:16. Gorgeous guitar. I'm not one for 'collectibles' so I'd have one made for a fraction of that sum but interesting all the same. Oh yeah, your date on Sotheby's seems slightly at odds with their letter head. Posted by djod on Sat, 11/01/2008 - 00:50. Tim, the guitar is not for sale, it is up as a charity prize where DJOD plans to give back to society. I even asked Sir Johan why is your guitar from him so expensive. He told me simply that there has never been a real Bob Marley guitar on the auction block / memorabilia block before & that memorabilia companies & the auction companies have no reference to look back to see it's worth & if he did put the guitar up for auction, it would be the 1st Bob Marley guitar on the block in the entire world. Since now it's 2008, Bob Marley has been dead for almost 30 years who now is world famous and who's music still lives on every single day, I was in awe, the guy I work for owns the world's most expensive guitar and nobody knows about it except you guys here and some few networking sites and other forums. Even Sotheby's auction company @ Sothebys.com said the same thing & their world famous auctioneers since the 1750's. The owner of the Hard Rock Cafe even refused to take it because it's so rare & is worried to have it displayed. Want to hear a funny story, Sir Johan just left this guitar in his basement sitting for 17+ years because to him, it was just a guitar from his friend Bob. It's when two of his guitars went missing that he decided to do something about Bob's guitar & hide it. So he started getting it appraised & finding out it's worth, he had to buy insurance that would cost him $1,000 a month, this is why he tried to plan to sell it before, Bob's guitar was causing chaos in his life, no joke. Before he even tried to sell it, he had to go ask Junior Marvin from Bob Marley and the Wailers if it was okay because Sir Johan didn't want to disrespect anyone especially Bob's Rastafarian religion, he even tried giving the guitar back to the Marley family, to Bob's son Ziggy Marley himself saying "I don't think your father's guitar is the right place in some white guy's basement in Vancouver." Ziggy refused to take it simply saying, "If my father gave you that guitar, it's yours, I won't take it." Trust me when I say he has more interesting stories, but I thought I'd share this one with you guys cause I find it funny, I guess I find it funny because I know him & it's who he is as a person always wanting to make things right. Posted by lee_UK on Sun, 11/02/2008 - 12:21. Nice guitar, looks a lot better than that Epiphone tribute Les-paul that came out a few years back, hope it raises a lot of money for charity. Posted by djod on Sun, 11/02/2008 - 13:25. It's better than the epiphone tribute simply because it's one of Bob's real personal guitars. This guitar has a huge historic value. Just another proof for you guys from DJOD's guitar page. Thank you for your encouraging words Lee. Posted by djod on Thu, 11/27/2008 - 16:16. More info about Bob's washburn. Washburn's electric guitar history began in 1978. Since the beginning, offering new innovative designs and features has been a hallmark of their Electric Guitar series. From their signature series guitars (born from a cooperative design effort with artists and design engineers). 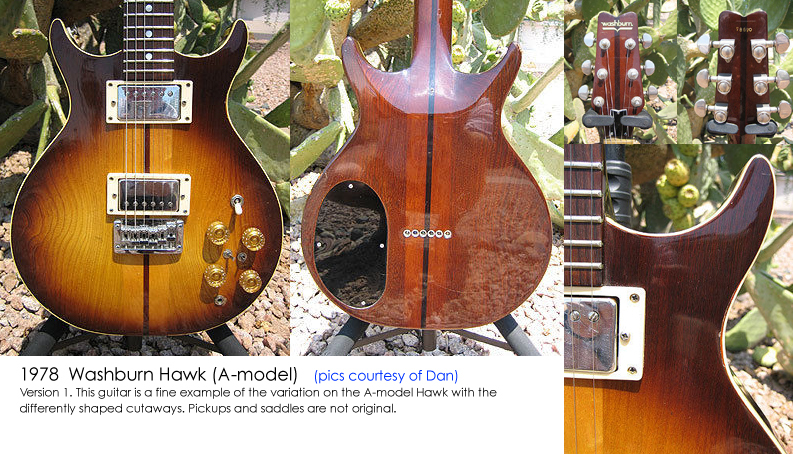 Some people think Bob's guitar is a falcon, but if you look closely both at the front and back of Bob's guitar to this hawk model pictured below, you can clearly see from my first posting that they have the similarities, and indeed is a hawk model. Posted by djod on Mon, 01/05/2009 - 15:23. More exciting news. Gary's story with Bob's guitar has been featured in CNN's first reports 2009. Posted by Nyztan on Fri, 08/28/2009 - 19:38. Posted by Riffin54 on Thu, 09/03/2009 - 19:28. Posted by sub006 on Mon, 01/25/2010 - 20:48. 1. Why the big bucks? Marley is revered as a singer and composer, not primarily as a guitarist. Which is why an Elvis guitar will not approach the value of a Clapton guitar. 2. Very pretty, it looks like a Carvin.